Earlier this year Google launched the Timelapse project, a global interactive map that uses three decades of Landsat imagery to show how our world is changing. One stunning example of human impact on the planet is the rapid buildout of Powder River Basin coal mines in the Thunder Basin National Grassland. In addition to domestic power production, coal exports are an increasingly controversial issue as demand in Asia increases. Exporting coal means even more mining here at home, long coal trains transporting it to ports through busy cities, increased train derailments, and more dirty coal terminals that spill and flood. Why Isn’t the Administration Doing a Better Job on Pipeline Safety? Why Isn’t the Obama Administration Doing a Better Job on Pipeline Safety? What’s going on with pipelines? Has there been a high number of major pipeline tragedies recently, or are such incidents just more in the news with widespread attention to potential federal approval of the proposed Keystone XL pipeline? As someone who has worked on pipeline safety and associated environmental protection issues since I began serving on a pipeline federal advisory committee in the mid-1990s, I can say confidently that the period from 2010-2013 has had a very large number of serious transmission pipeline tragedies compared to the previous decade (serious in the lay-person’s sense of the term, i.e., not the relatively narrow definition developed by federal pipeline regulators). 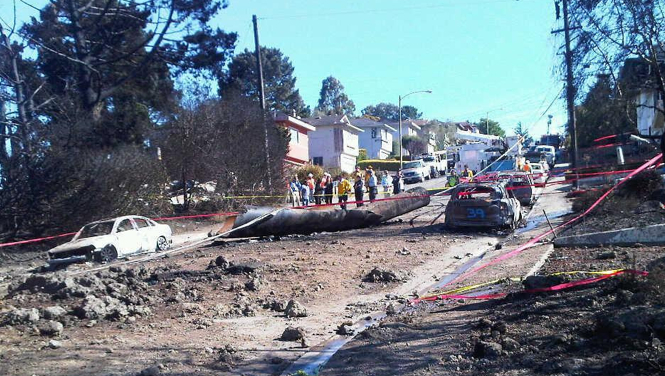 The worst of these incidents – Pacific Gas & Electric’s San Bruno, Calif., natural gas explosion in 2010 which killed eight and injured many; Enbridge’s Marshall, Mich., tar sands oil spill in 2010 that closed 40 miles of the Kalamazoo River for two years with the cleanup still ongoing; ExxonMobil’s Mayflower, Ark., tar sands oil spill in 2013 when oil flowed through a neighborhood; and Tesoro Logistics’ giant oil spill into a North Dakota wheat field with no leak detection mechanism in place – compare in scale to the biggest pipeline incidents of the past. At a time of technology improvements including advances in leak detection and with a pro-government administration in place, why are we still experiencing preventable transmission pipeline tragedies of this size and scale? The federal Pipeline and Hazardous Materials Safety Administration (PHMSA), part of the U.S. Department of Transportation, oversees pipeline safety and environmental protection nationwide. PHMSA performs this job through regulations and their enforcement, advisory bulletins, education, safety research, permit approvals, and partnerships with many state pipeline regulators. Congress guides PHMSA’s work, with the most recent pipeline safety law reauthorization signed by President Obama on Jan. 3, 2012. 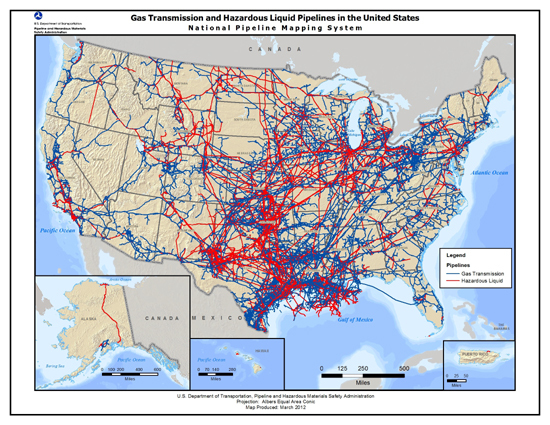 According to PHMSA, in 2012 there were more than 185,000 miles of hazardous liquid transmission pipelines (generally crude oil and its products like gasoline and diesel) and nearly 303,000 miles of natural gas transmission pipelines in the United States. The following map shows the locations of these transmission pipelines. The map does not show federally-unregulated pipelines including extensive rural “gathering” line mileage– likely an up-and-coming problem in terms of safety and the environment as unregulated shale gas and oil gathering lines age and corrode. Early in the Obama administration, PHMSA began a review of its hazardous liquid (49 Code of Federal Regulations Part 195) and natural gas (49 Code of Federal Regulations Part 192) transmission pipeline regulations, and requested public comments on what changes should be made to improve those regulations. These “advanced notices of proposed rulemaking” (ANPRM) were issued on Oct. 18, 2010, for hazardous liquid transmission pipelines and on Aug. 25, 2011, for natural gas transmission pipelines. Commenters included industry, state and local governments, public interest organizations, and individuals. Despite extensive and broad interest in updating and streamlining these regulations, PHMSA has not issued the necessary follow-up rulemaking proposals. These regulations are needed reforms that have not progressed at all during the five years of the Obama administration. PHMSA’s regulatory paralysis is unacceptable to those who lived through past transmission pipeline tragedies and to everyone who lives near or cares about pipeline safety. Providing upgraded regulatory coverage for unregulated or minimally-regulated pipelines especially rural gathering lines, “produced water” lines which contain briny subsurface fluids, multi-phase pipelines containing oil, gas, and produced water, and pipeline segments not likely to affect “high consequence areas” (currently, integrity management requirements apply only to pipeline segments likely to affect high consequence areas). Leak detection requirements for oil and natural gas transmission pipelines. There are no federal leak detection performance standards at present (some states have such standards) so – if operators have leak detection at all – there are no standards for how well these mechanisms must perform, e.g., what their detection levels must be and the speed of detection. At the request of Congress, PHMSA has developed several studies on leak detection, however the report findings have gone nowhere (much to the dismay of leak detection equipment manufacturers). Instituting shut-off valve requirements for both natural gas and oil pipelines to minimize the sizes of releases. These regulations would include shut-off valve location requirements. What will it take to get the Obama administration to move forward on these important regulatory initiatives? Sadly, relatively frequent, major pipeline tragedies do not appear to be enough. Congress should be concerned about this and may need to hold hearings on why there have been regulatory development delays, especially after it did its job in 2011 reviewing and passing the pipeline safety statute reauthorization with bi-partisan votes in both the House and Senate. The new Secretary of Transportation, Anthony Foxx, also needs to be aware of, and to take action on, the unacceptable regulatory paralysis that currently prevents pipeline safety improvements. As Michelle Obama says, “Let’s move!” and reform those old requirements. https://skytruth.org/wp-content/uploads/2013/10/enbridge.jpg 480 640 John Amos /wp-content/uploads/2016/08/test_logo.png John Amos2013-10-22 22:24:002019-02-14 11:21:59Why Isn’t the Administration Doing a Better Job on Pipeline Safety? Back in late August we posted about a gas well on fire in the Caspian Sea at a drilling rig in the Bulla Deniz gas field. Well guess what – 61 days later it’s still burning! Above: Near-infrared satellite image of the burning well, seen as a red-orange spot with a bluish plume of smoke to the north. Image acquired October 15 by NASA MODIS/Terra. The SOCAR No. 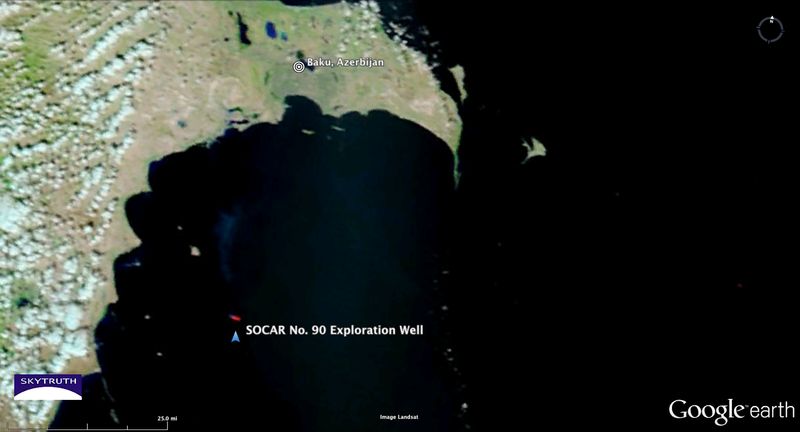 90 exploration well is reportedly around 18,000 feet deep (5,500 meters), but this part of the Caspian Sea appears to be quite shallow, unlike the site of the infamous BP / Deepwater Horizon disaster in the Gulf of Mexico in 2010. Fortunately we see no evidence that oil is spilling from this blazing platform owned by the Azerbaijani state oil and gas company. There are a few vague reports about firefighting efforts, but given the heat of the fire and the how long it has burned, we suspect they are waiting for it to “bridge over” and eventually go out on its own like the Hercules 265 rig did after it caught fire in the Gulf of Mexico earlier this summer. Due to the U.S. government shutdown we cannot access higher-resolution Landsat images, but you can see an older Landsat 8 image we marked up here. You can learn more about this incident and compare the visible-light satellite image with a near-infrared image here. Find something interesting on NASA’s Worldview site? Share it with us on Facebook or Twitter! 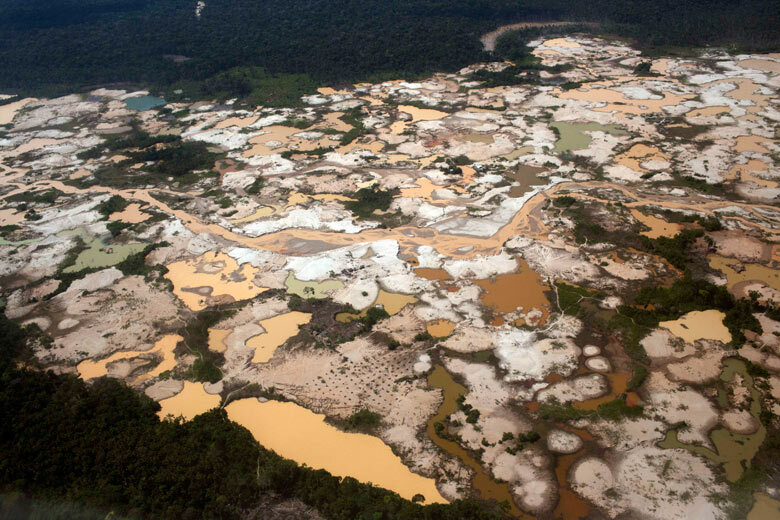 Aerial view of many small-scale artisanal gold-mining operations in the Madre de Dios region of the Peruvian Amazon. Source: The Guardian. 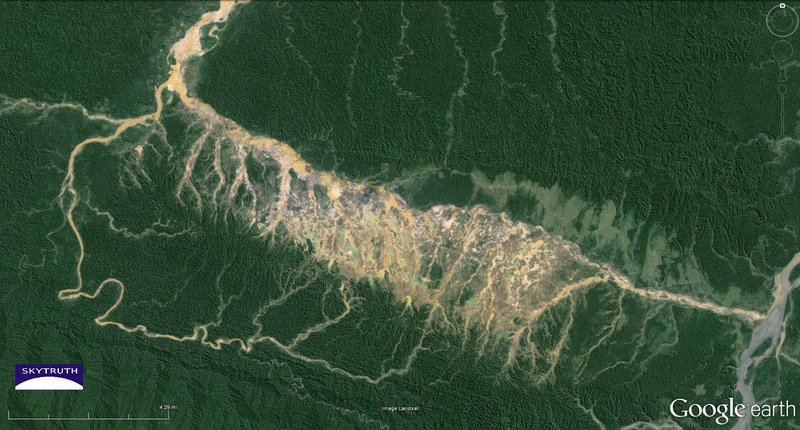 Landsat-8 satellite image taken in April 2013, showing landscape impact of illegal gold mining operations and sediment-laden runoff in adjacent rivers – a harbinger of the mercury contamination affecting indigenous people downstream. Intact forest is dark green. 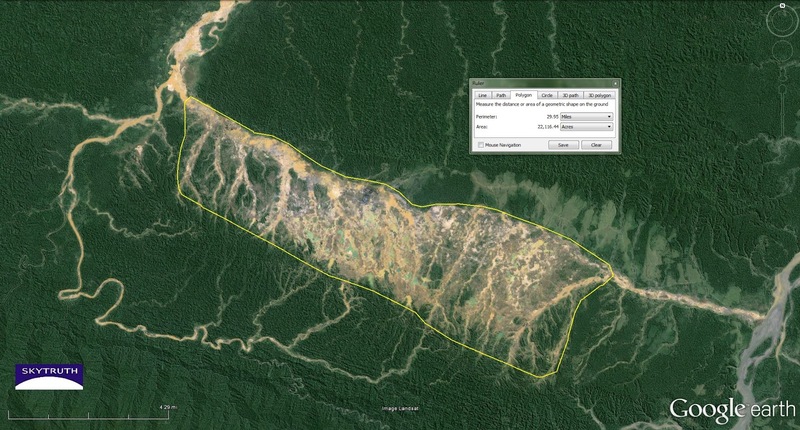 Land cleared for agriculture or by logging is pale green. 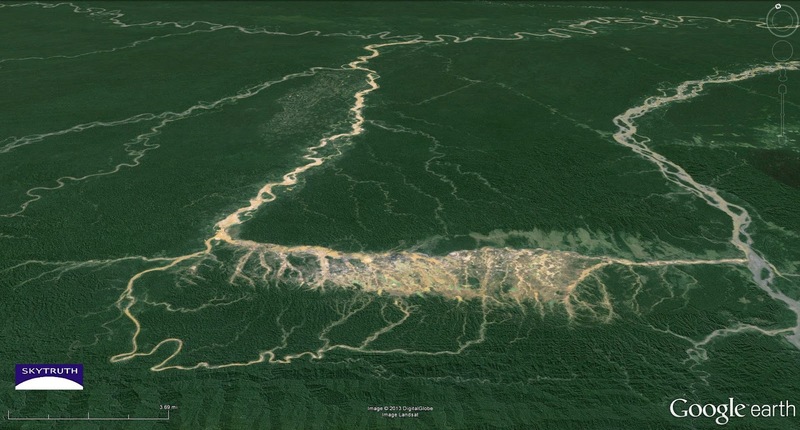 Measurement of the area impacted by mining; this does not include adjacent areas of deforestation (pale green) that probably indicate rapid settlement and farming accompanying the influx of miners. 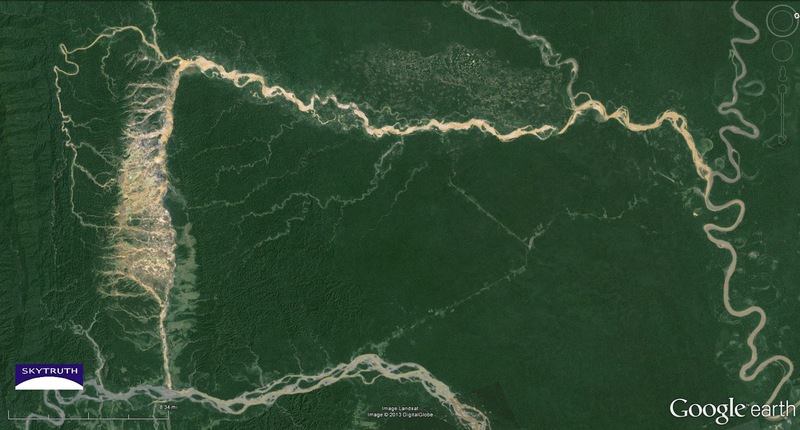 Vertical overview of mining area and downstream transport of pale brown sediment (north is to the right in this view). Panoramic view toward the north, overlooking the active gold-mining area (foreground) and showing sediment runoff downstream. Landsat-8 satellite image taken in April, 2013. We’ve been getting questions about the status of the National Response Center, mostly wondering if public safety is being impacted by the Federal government shutdown. The major oil spill from a ruptured pipeline in North Dakota, discovered by a farmer on September 29 but not made widely public until October 8, is driving some of this concern. Some of the website functionality is down, including the “Online Reporting Tool” for reporting spills and other incidents, and the “Query Standard Reports” tool to search for, and download, recent (2013) reports. Polluters and concerned citizens can still report oil or hazmat spills, or suspected spills, via telephone (1-800-424-8802). These reports are being distributed as usual to local, state and Federal responders and others who are on the distribution list. Older reports from previous years can still be downloaded in bulk. 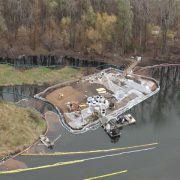 The first report of this spill was filed with the NRC at 1:16 am on September 30, before the government shutdown took effect. 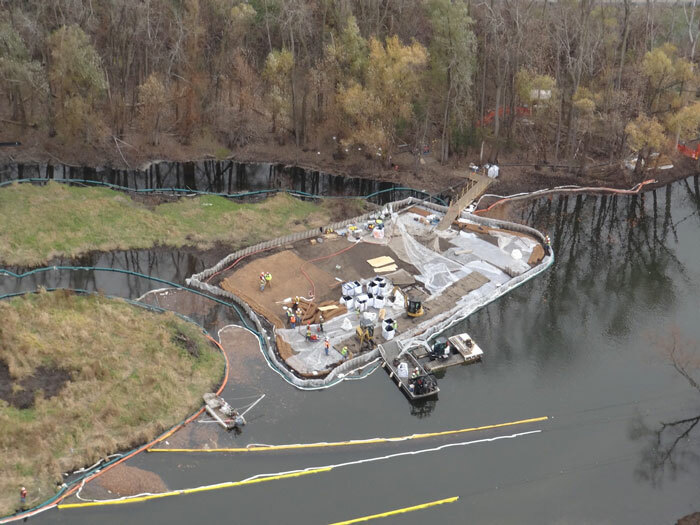 It did not include any estimate of the spill size, so it didn’t attract much notice. It does not appear in the SkyTruth Alerts system, possibly because it didn’t include enough specific location information for us to place it on the map; we won’t know for sure until we can see this report. A second report was filed with NRC on October 8 to provide an update on the spill. 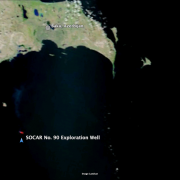 It included the 20,000-barrel spill estimate. Our Alerts system wouldn’t have been able to access this report because the government shutdown was in effect. Neither report is currently available for download from the NRC. You can submit a FOIA request to get them, or wait until our government sorts itself out and gets up and running again, and the NRC website’s full functionality is restored. Jacob Wiedmer, who was helping Jensen harvest his wheat crop, likened the Sept. 29 discovery to the theme song from “The Beverly Hillbillies” television show.